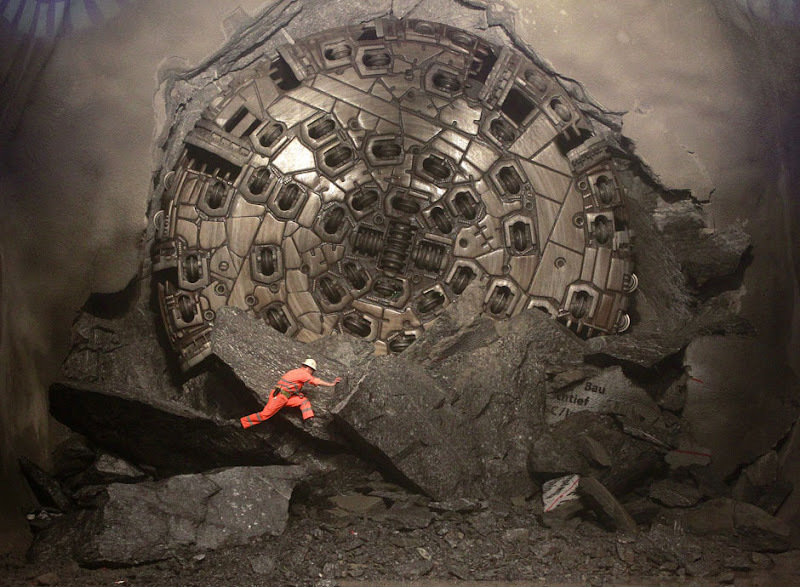 “After the intersection of the first 35.41 mile long tube of the Gotthard Base Tunnel on October 15, 2010 the final break-through in the second parallel single track tunnel took place on March 23 this year. More than twenty years of planning and construction work at the world’s longest railway tunnel crossing the Swiss Alps took a crucial hurdle. Together with miners and a group of journalists I was shuttled from the Alptransit construction camp in the southern Swiss town of Faido by bus through a side access tunnel to the station of a mining railroad deep in the mountains. It took us 45 minutes by train to reach the venue of the intersection ceremony underneath the St. Gotthard massif.